WinRE: So is there any good way to get MDT to place any form of WinRE on a partition other than C:? Single Partition Deployments – There is no other options but to place WinRE.wim on C: since this is the only drive, which should be Partition 1. UEFI with Recovery Partition – When deployed with MDT 2013 Update 1 (R2), a UEFI system will have an EFI System Partition (1), an MST Partition (2), Windows Partition (3), and Recovery Partition (4). 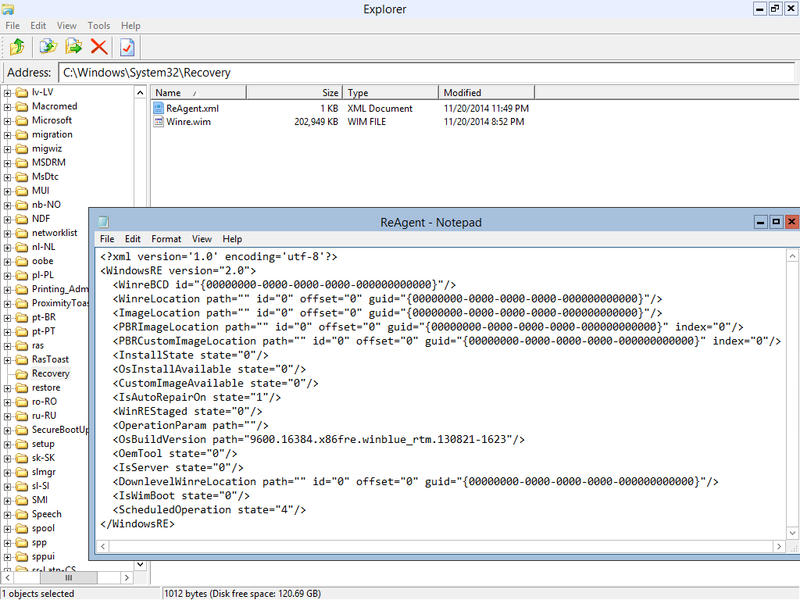 In this case WinRE.wim will automatically be placed on the Recovery Partition (4). Prior version of MDT created a Recovery Partition at the beginning of the drive. In these cases, WinRE.wim would be in the Recovery Partition (1). This assumes that there is enough space on the Recovery Partition. If not, WinRE.wim will be on C:, except in the case of Windows 10, which will create an additional Recovery Partition. So as long as your Partitions are set properly there is nothing you need to do. Now you are going to run your Task Sequence from Imported Operating System Media. Once you start your Task Sequence and the Install Operating System step is complete, WinRE will be located on your OSDisk in Windows\System32\Recovery. ReAgent.xml will have a bunch of zeroes everywhere, which basically means that it is not enabled. Hopefully you read my post on WinRE: Media Install of Windows 8.1 (and Partition Problems!) and realize there is a problem with the UEFI Partitioning of Windows RE tools being 300MB. I still stand by my Partition Recommendations of increasing the size of this partition, and this post will show how close this Partition is to almost working. During the Generalization phase of Unattend, Windows Setup will try to move WinRE.wim from C:\Windows\System32\Recovery to where it needs to be, which is in the System Partition of BIOS MBR (Partition 1) or the Windows RE tools Partition of UEFI GPT (Partition 1). Now I should first post about what WinRE is before writing this, but most of us know what it is so I will address that later. 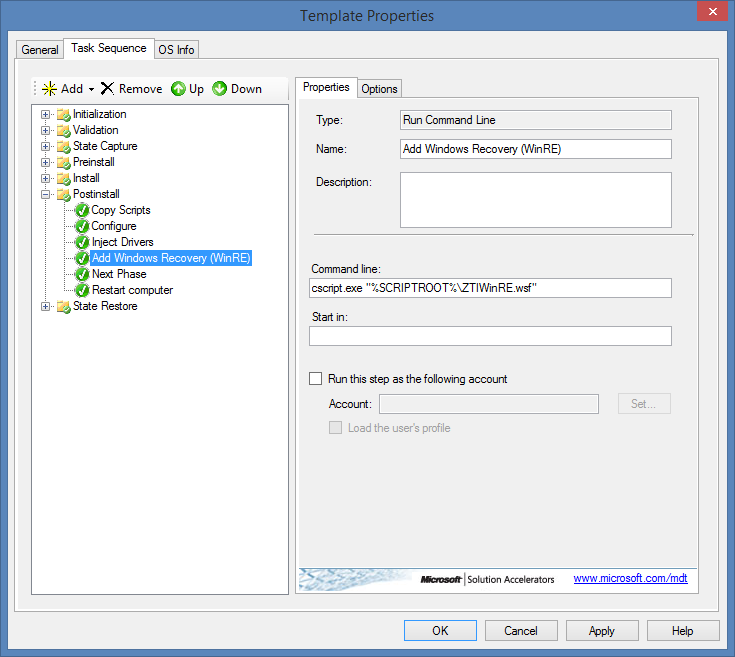 This post will focus on MDT and the implementation of ZTIWinRE.wsf that is referenced in the Task Sequence Step Add Windows Recovery (WinRE). Ok. Now for the ELI5. 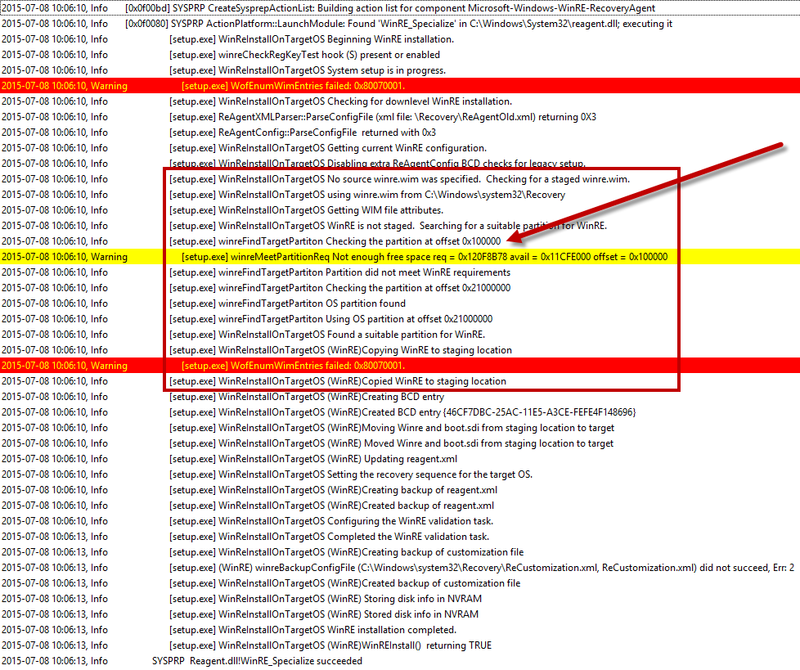 For starters, in MDT there is a Step in the default Client Task Sequence called Add Windows Recovery (WinRE). This is in the Postinstall phase. As you can see it is a simple Run Command Line entry to run ZTIWinRE.wsf (in the Scripts directory).